Our Suburban Farm: Just a little too tan! So Erin tagged me for this photo-meme and since I LOVE photographs...I was SO excited! I had to open my first photo folder, upload the 10th photograph and post the story behind it. 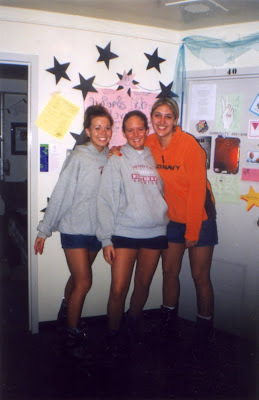 This photo was taken in the dorms my freshman year in college. It is me (in the middle) with two of my future roommates (for the following year after we moved out of the dorms). Kristin is on the left and Karyn is on the right. We were getting ready to go roller blading..but what I notice the most is our crazy tanness. At that point we were all three a bit obsessed with tanning. It was nice to have friends to go with, but now we can admit we were just a little too orange! But boy....do our legs look good! I tag the following girls to play along...come on...it is fun!